On a budget or looking for something extreme, either way our custom PC builder will give you the flexibility you need to get exactly what you want out of your new PC.With a huge range of components to suit every need, just create and enjoy, we handle the assembly and testing for you, and if you buy an operating system too, your PC will arrive all ready to use. What is a custom PC without a nice shiny case to put it in? Well for one it would be less of a PC and more of a bunch of electronic parts on your desk. Not only responsible for holding your PC components together, the case is also important for cooling ... and looking good! The very foundation of your PC, the motherboard is the place where all of the various components attach to. From the buttons on your case back to the power supply, this thing has sockets for everything. Power is needed to power everything in your PC surprisingly. These little boxes of electrical fun and games take the fruits of a power socket and distribute it to all of the parts that need it. If the motherboard is the foundations of your PC, the processor is the beating heart (becauseyou get beating hearts in buildings that have foundations) . This is the part that digests all of the little 0's and 1's that you computer understands and does math with them so if this is slow and not up to scratch, your entire PC is slow and not up to scratch. 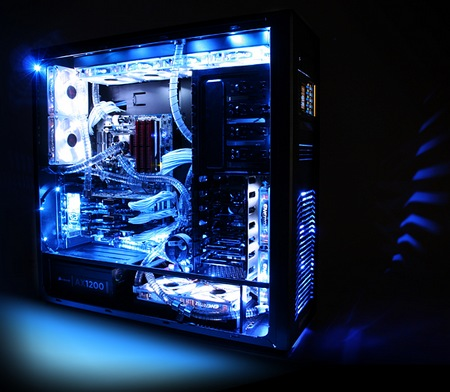 On a budget or looking for something extreme, either way our custom PC builder will give you the flexibility you need to get exactly what you want out of your new PC. With a huge range of components to suit every need, just create and enjoy, we handle the assembly and testing for you, and if you buy an operating system too, your PC will arrive all ready to use.